Rewind back to this point last season when we were not only keeping track of the Thunder’s record, but also keeping track of the Raptor’s record. Because of the James Harden trade at the beginning of last season, the Thunder held the Raptors first round pick, which was Top 3 and 15-30 protected. At this point last season, it was known that the Raptors weren’t making the playoffs. The only question was where the Raptors would be picking in the 2013 NBA Draft. Well, the Thunder ended up with the 12th pick and they selected Steven Adams with that pick. Fast forward to this season, and the Raptors are the No. 3 seed in the East. If that pick would have somehow been moved to this season, the Thunder would have had to wait another season for a possible lottery pick. Thank goodness Rudy Gay happened to the Raptors last season. This will be the 2nd and final meeting of the season between these two teams. 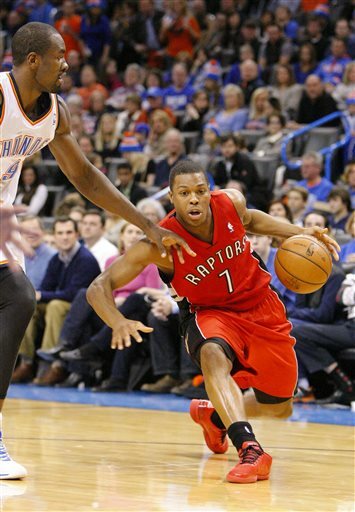 The Raptors beat the Thunder on Dec. 22nd, 104-98. In that game, the Raptors used a 15 point advantage in the 4th quarter to turn a 9-point deficit into a 6-point victory. The Raptors had 5 players that scored at least 13 points, while, for the Thunder, only Kevin Durant and Russell Westbrook scored in double figures. The Raptors’ season could be broken down into two phases: With Rudy Gay and Post Rudy Gay. In the first 19 games of the season, the Raptors were 7-12 and looking like a lottery bound team. Then they traded Rudy Gay to the Sacramento Kings. Since then, they are 31-17 and one of the top defensive teams in the league. They allow only 97.5 points per game, good for 5th in the league. They are led by Kyle Lowry and DeMar DeRozan. Lowry has become one of the better offensive point guards in the league and DeRozan has become a much better scorer in Gay’s absence. Terrence Ross is hot and cold, but if he gets hot, he has the ability to score many points in a short time. 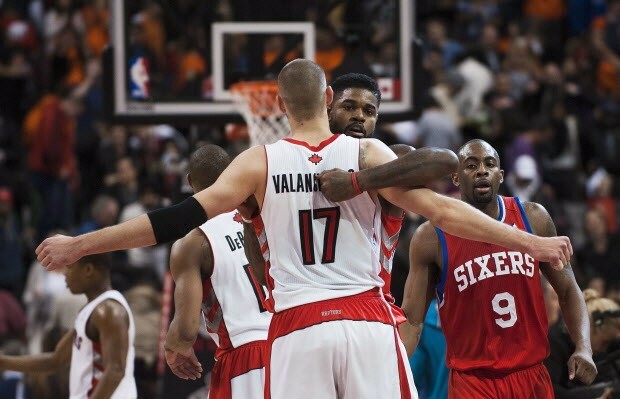 Up front, Amir Johnson is a double double waiting to happen, and Jonas Valanciunas is just now tapping into his potential. The Rudy Gay trade provided the team with much of their fire power off the bench and leads to a much balanced team. 1. Pick and Roll Defense – Kyle Lowry does a great job of penetrating in the lane and using his strength to score in the paint or rack up fouls on the opposing team. His PnR with Amir Johnson is one of the better ones in the league. And if the defense collapses, Terrance Ross (who shoots over 40% from 3-point territory) and DeMar DeRozan are waiting on the wing. A lot like the Lakers game, this may be a game where Roberson’s perimeter defense helps the Thunder out. 2. Rebounding – The Raptors aren’t necessarily a great rebounding team, but their big wings and active interior players can get their hands on a lot of loose balls. 3. 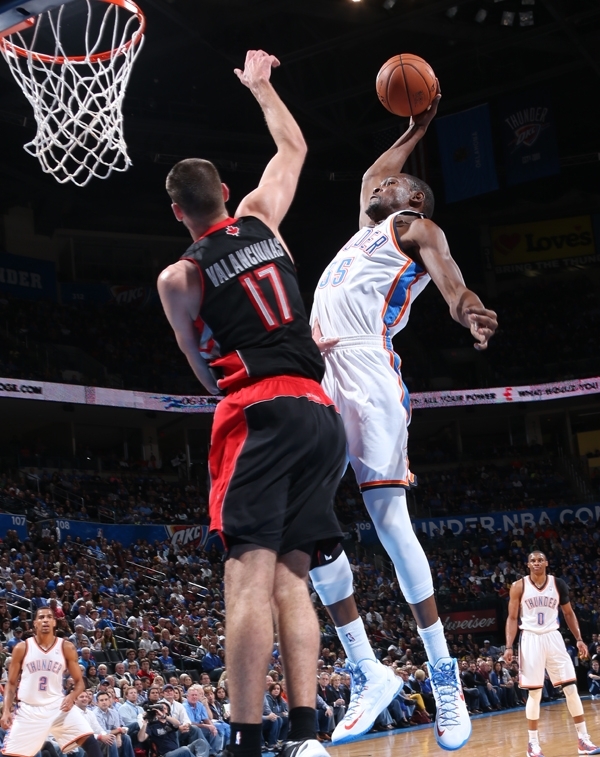 Last Team Standing – The Raptors are the only team the Thunder have not beat this season. True, they only play them twice due to the Raptors being an Eastern Conference team. But, beating every team in the league at least once is a feather in the cap in my books.